Over the last couple of weeks, the Dawn Spacecraft has been beaming back spectacular pictures of Ceres – a world, discovered more than a century before Pluto, about which we know very little. This is the story of its discovery, and humanity's impending visit to one of the last unexplored planetary bodies in the solar system. In the beginning, astronomers knew of other planets in the solar system: Mercury, Venus, Mars, Jupiter, and Saturn. Over centuries, astronomers have directly observed the major planets and their movements, but with the invention of the telescope in Netherlands in the early 1600s, astronomers had a new tool. Shortly after its invention, Galileo Galilei began to study Jupiter and discovered a series of moons, in and of itself a major advance in our understanding of the astronomy. Study began in earnest on the rest of the solar system, and as we began to learn more about our neighbors, astronomers began to formulate theories on the placement and orbits of the planets. While the notion of other planets had been commented upon, most predicted new planets to be discovered beyond Saturn, but some, such as Scottish mathematician Colin Maclaurin in the late 1730s, theorized that a body might exist in the gap between Mars and Jupiter. Based on the observations that he had made up to 1766, Johann Daniel Titius came up with a theory that planets orbited at predictable intervals in the solar system, writing in a translation of Charles Bonnet's Contemplation de la Nature, "Take notice of the distances of the planets from one another, and recognize that almost all are separated from one another in a proportion which matches their bodily magnitudes." It was here which he noted a major gap, one between Mars and Jupiter: "From Mars there follows a space of 4+24=28 such parts, but so far no planet was sighted there. But should the Lord Architect have left that space empty? Not at all. Let us therefore assume that this space without doubt belongs to the still undiscovered satellites of Mars, let us also add that perhaps Jupiter still has around itself some smaller ones which have not been sighted yet by any telescope." Several years later, German astronomer Johann Elert Bode paraphrased Titius's theories in his own work, Anleitung zur Kenntniss des gestirnten Himmels, also noting the gap between Mars and Jupiter. On March 13, 1781, William Herschel discovered a new planet beyond Saturn: Uranus (which he named George). The new planet also fell exactly where Titius and Bode's rules said it would, lending further credibility to the astronomers. Uranus was also the first discovered using mathematics and telescopic observations. Armed with the confirmation of other planets, the search for new worlds in our home system ramped up throughout the rest of the century, particularly where the rule predicted another planet between Mars and Jupiter. The discovery of a new world there would help to satisfy what was referred to as the Titius-Bode Law. The law gave direction to a number of astronomers who aspired to enter the history books. One such astronomer was Baron Franz Xavier von Zach of Gotha, Germany, the director of the local Gotha Observatory. He became the leading figure in the charge to discover the unknown planet. As David A. Weintraub noted in his book Is Pluto A Planet: A Historical Journey through the Solar System, this was a more difficult proposition than it seems: "the Titius-Bode rule provided information only about distance from the Sun, not about celestial longitude or latitude. Thus, since the missing planet could be in any direction in the sky, von Zach was unable to predict in which direction observers should point their telescopes to search for the predicted eighth planet." The search was a figurative needle in a large, dark haystack. Von Zach was undeterred, and in 1787, he started looking. Nine years later, and with no planet found, he assembled a number of prominent astronomers for a conference in Gotha to figure out how to go about finding it. Weintraub outlined the historical significance of the gathering: "At this meeting, the French astronomer Joseph Jérôme Lefrançois de Lalande suggested that a large number of observers could, together, conduct a systematic, coordinated search for Bode's planet. Such a search would have been an unprecedented, international collaboration to do what, in modern terms, we call 'big' science." Von Zach followed up on the idea in September of 1800, assembling a super group of Europe's leading astronomers in Germany: Johann Hieronymus Schröter, Karl Ludwig Harding, Heinrich Wilhelm Matthias Olbers, Freiherr von Ende, and Johann Gildemeister. They called themselves the Celestial Police, and invited an additional eighteen astronomers to aid them in their search. Each one took a 15° by 15° section of the sky, and began to watch for any changes that would indicate a planetary movement. It was slow, observational work: stars would remain in their formations above, while a planet orbiting the Sun would change night to night. For the rest of the year, the international group looked for such a movement. On the 1st of this month, a new comet in the shoulder of Taurus, near the 19th star of Mayer, has been discovered from our observatory. It was observed on the 1st, 2nd, 3rd and 4th, as it passed the meridian. Although it is not covered with any kind of nebulous spot, it still cannot be seen with the naked eye. Its movement is retrograde; it goes forward towards the north. Piazzi also sent letters to Bode and Lalande, both of whom were intrigued by the discovery. Bode noted that "I quickly supposed that this small star without nebulosity odd," and began to run some calculations based on what he had learned. What came back was exciting: the object lay right where his own rule had predicted a planet would exist in the solar system, between Mars and Jupiter. Piazza himself seemed to hold a small amount of hope that what he had discovered wasn't a comet, but "something better": the missing planet. Based on his observations, however, he wasn't sure and by February 11th, however, it passed out of observational range. Piazza named the object Cerere Ferdinandea, after the Roman goddess of Agriculture, and set about trying to determine the object's orbit so that other astronomers could observe it. You, my respectable friend, simply told me that Piazzi himself suspected several times that the comet could just as well be a planet. And Piazzi even had a good reason to suspect it since its motion is very slow and he always saw the star without any nebulosity. You, my good friend, immediately calculated the orbital elements in a circular orbit and thus saw that the planet had its place between Mars and Jupiter. You can easily calculate all this since Piazzi had already told you that he considered his comet a planet. But how could Bode immediately tell from a handful of numbers, even after a calculation, it was a planet? Credet Judaeus Appella, I do not believe it! It is truly unpardonable that this Sicilian has made a secret of his discovery for such a long time. If he had notified the astronomers in time, we would have known what to hold on to, for one would have been able to observe his planet, his star, his comet, his chimera during the entire months of March and April, and we would know at present what it is. All the astronomers found his conduct and secrecy very reprehensible. Your important remarks will be made public four weeks later, which means quite a period of time and is relevant in searching for the heavenly body, but I informed some of my astronomical friends, hunting for the planet carefully, that you extended the examination area further and thus might look farther east. I myself will be following this suggestion and send you daily news if I should be so fortunate to find this wanderer again. Find it he did: in January, after a frustrating search in December, von Zach found Ceres in his telescope, along with fellow Celestial Police astronomer, Olbers. Ceres was indeed there, and more importantly, verified by other scientists. In 1802, Piazza published his findings in Della scoperta del nuovo pianeta Cerere Ferdinandea (The Discovery of the New Planet Ceres Ferdinandea). The discovery was a major find for the astronomy world: another planet discovered after Uranus, and one that fit with the Titius-Bode Law. While the Celestial Police failed in their mission to discover the new planet, they were successful in other ways: Just a year after Oblers and von Zach helped to confirm the discovery of Ceres, Olbers made another discovery on March 28th, 1802: an object similar to that of Ceres in roughly the same orbital area. He named the object Pallas, and sparked a small debate as to the nature of the newly discovered worlds. They knew that each was far smaller than the other planets due to their relatively low brightness. In 1804, Hardling observed another such world which he named Juno. On March 29th, 1807, Olbers discovered a fourth world: Vesta. Most astronomers had begun to refer to these new discoveries as planets for the next several decades, until the discovery of Neptune in 1846, prompting the astronomical community to redefine Ceres, Pallas, Juno, Vesta and the recently discovered Astraea. (Incidentally, the discovery of Neptune spelled the downfall of the Titius-Bode Law) Their orbits and nature were far different from their larger counterparts, and by 1847, the objects were formally designated Asteroids. The Solar System, which had counted thirteen objects as planets, was re-counted to seven in all. Ceres's demotion from planetary status opened up an entirely new designation for solar system objects: asteroids. From 1847 onward, the discovery of the Asteroid Belt brought up new questions about the formation of the planets: the picture was becoming more and more complicated. Initially, astronomers theorized that the belt was the remains of a planet that had occupied the gap between Mars and Jupiter, one destroyed in a major collision. However, this theory has since been discounted: the amount of energy to break up a planetary mass is enormous, while the entire mass of the asteroid belt thus discovered amounts to less than that of Earth's Moon. Up to half of the mass of the asteroid belt is also contained in Ceres, Vesta, Pallas and Hygiea. (Ceres contains 30%, Vesta 9%, Pallas 7% and Hygiea 2.9%.) Some of that mass has dissipated: each of the rocky planets have evidence of major impacts, while Jupiter has likely also seen its own impacts. Carl Sagan in Cosmos described the Asteroid Belt as "a great grinding mill, producing smaller and smaller pieces down to motes of dust…[and] may be a place where a planet was once prevented from forming because of the gravitational tides of the giant nearby planet Jupiter." It's likely that the asteroid belt formed early on in the solar system's history. According to Thomas B. McCord and Christophe Sotin in their paper Ceres: Evolution and Current State, due to the "spectral reflectance, the low density and the location of the Solar System, it is thought that Ceres was formed mostly of unaltered carbonaceous chondrite source material with water ice. Evidence from these and other meteorite types suggest that Ceres and other asteroids formed very early in the age of the Solar System, probably within a few up to about 10 million years. Furthermore, the go on to explain that Ceres is orbiting near where it formed, and that it hasn't changed much since that time. This makes the object a highly desirable object to study, as it could be a time capsule to the earliest days of planetary formation. In all likelihood, Ceres could be a representative example of what early planetary formation might have looked like at the start of the solar system. One of Ceres' most intriguing features is the water that's present on its surface. McCord and Sotin cite prior papers that the planet's mass could be anywhere from 17% to 25% water, which could date back to the object's formation. On August 16th, 2006, the International Astronomical Union met after two years of work to create new defining rules for bodies in the solar system. Amidst the variety of proposals was one that concerned Ceres and the system's furthest recognized planet, Pluto. The new observations of bodies in the solar system challenged the original understanding of planets, and they required a new definition. A "dwarf planet" is a celestial body that (a) is in orbit around the Sun, (b) has sufficient mass for its self-gravity to overcome rigid body forces so that it assumes a hydrostatic equilibrium (nearly round) shape , (c) has not cleared the neighbourhood around its orbit, and (d) is not a satellite. All other objects , except satellites, orbiting the Sun shall be referred to collectively as "Small Solar-System Bodies". In the fervor which has followed and persisted, Pluto's status was downgraded from Planet to Dwarf Planet, but at the same time, Ceres was upgraded from Asteroid to Dwarf Planet. Three other bodies, Haumea, Makemake, and Eris were also promoted to Dwarf Planet status, although Charon remains classified as a moon. Over the course of the 20th Century, astronomers began to study the Asteroid Belt in greater detail, and through their efforts, we began to learn a bit more about it: it composed a dominant part of the belt. The large amounts of water likely present on Ceres made the asteroid a high priority, along with 3-Vesta when NASA began selecting targets for the Dawn mission in 2001. Ceres had been observed by astronomers at a distance, but the first close images that were taken of the asteroid came on July 21st, 1992 from the Hubble Telescope, using the telescope's Faint Object Camera, revealing the circular body. Due to Ceres' unique location and predicted makeup, the planet became a priority for unmanned exploration efforts. As early as 2003, NASA began to plan for a new mission, Dawn, which would be used to explore Ceres. However, the project was cancelled in the winter of 2003, only to be reinstated the following spring. However, due to budget issues at NASA, the Dawn mission was "indefinitely postponed" while "Mission managers had been ordered to halt work on Dawn last fall while the project was assessed by an independent review team,". Following the hold, the probe's builder, Orbital Sciences Corporation offered to build probe 'at cost', and the cancellation was reversed. Dawn was equipped with a unique propulsion system: three NSTAR ion engines and monopropellant reaction control system, which would continuously provide a small amount of thrust. The engine is far less powerful than a conventional rocket engine, but utilizes little fuel, instead relying on continual thrust to gather speed over a longer period of time, allowing the mission to visit two bodies in the Asteroid Belt, rather than one. While preparations for the mission were underway, the Hubble Space Telescope turned its gaze back to Ceres in June, 2007, capturing a number of higher-resolution images. New features could be discerned from the pictures: bright and dark areas on the dwarf planet's surface, as well as dramatic white spots. After a number of delays, a Delta II 7925H launched Dawn into space on September 27th, 2007, carrying with it two framing cameras, a Visible and Infrared Mapping Spectrometer and a Gamma Ray and Neutron Detector. By February, 2009, Dawn reached Mars, and used the planet for a gravity-assist maneuver, which sent the spacecraft into the asteroid belt. In July 2011, Dawn arrived at Vesta, where it began its scientific mission: first orbiting from 2,750 kilometers, before dropping down to 680 kilometers in September, and 210 kilometers in December. Dawn returned the first detailed pictures of an asteroid to Earth, and enormous amounts of research material about the body. In May, 2012, NASA released a study that theorized that Vesta was the last remaining major asteroid in the belt, as well as preliminary indications that it might contain water. Despite the delays, Dawn caught its first glimpse of Ceres on December 1st 2014, and returned new images throughout January 2015. 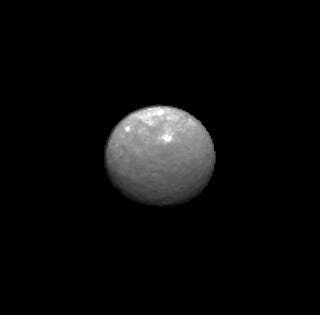 By January 26th, Dawn's images overtook the resolution of all prior pictures taken by the Hubble Space Telescope, and continue to return new, more detailed images each day it comes closer to the dwarf planet. By March 6th, it's expected to reach its first orbit of Ceres at 13,500 kilometers. Dawn's leisurely pace compared to the spinning world beneath it presents a very convenient way to map it. It is almost as if the probe hovers in place, progressing only through a short arc of its orbit as Ceres pirouettes helpfully before it. When Dawn is on the lit side of Ceres over a latitude of about 43 degrees north, it will point its scientific instruments at the unknown, exotic surface. As Ceres completes one full rotation, the robot will fill its data buffers with as much as they can hold, storing images and spectra. By then, most of the northern hemisphere will have presented itself, and Dawn will have traveled to about 34 degrees north latitude. The spacecraft will then aim its main antenna to Earth and beam its prized findings back for all those who long to know more about the mysteries of the solar system. When Dawn is between 3 degrees north and 6 degrees south latitude, it will perform the same routine, acquiring more photos and spectra as Ceres turns to reveal its equatorial regions. To gain a thorough view of the southern latitudes, it will follow the same strategy as it orbits from 34 degrees south to 43 degrees south. Afterwards, the spacecraft will look for water vapor or signs of water, all while it drops its orbit in April and May 2015 for an even closer look at the dwarf planet's surface. Over the coming weeks and months, we will be treated to new and exciting images of one of the last unexplored major bodies in the solar system. Despite its discovery over two centuries ago, we know very little about the nature of Ceres, and by visiting it and Vesta, the Dawn Spacecraft will explore around 40% of the Asteroid belt's mass. This is an extremely important mission for planetary scientists: as Ceres and Vesta are believed to be some of the oldest objects in the solar system, and even unique within the solar system, they provide a window into the solar system's past that will help provide answers about the creation and nature of our solar neighborhood. Dawn has also demonstrated its use to the unmanned exploration field by visiting and orbiting two separate bodies, and returning not only its stunning images, but a wealth of information that will keep researchers busy for years to come. In a point in time when the United States has ceased launching its own manned missions, it's important to recognize that space exploration doesn't necessarily require a manned presence: the last couple of years have seen the unprecedented successes of a number of unmanned systems, from the Kepler Space Telescope (still hanging on despite equipment malfunctions), the Curiosity Rover on Mars, the European Space Agency's Rosetta mission to Comet 67P/Churyumov–Gerasimenko and the upcoming mission to Pluto and Charon by New Horizons. Despite the reduced access of American Astronauts to space, we're living in a golden age of solar system exploration, which will exponentially expand our understanding of the worlds around us. 214 years ago, the members of the Celestial Police and astronomer Giuseppe Piazzi helped to start humanity's journey into understanding the solar system. They invented new methods for using group efforts to discover exciting worlds and features beyond the Earth, and completely changed how we looked at the Earth, our fellow planets and everything in between. Two centuries later, we're continuing that journey in ways they never could have imagined, but in ways which they would likely be just as excited as we are.